Preheat oven to 375 degrees F and line a small baking tray with all natural parchment paper. Heat ghee or coconut oil over medium heat. Once hot, add onions and sauté, 4 minutes. Add squash and mushrooms and sauté until tender, about 4 minutes. Add garlic during the last 2 minutes of cooking. Remove from heat and sprinkle on sea salt, pepper, and red pepper flakes, if using. Stir to incorporate. 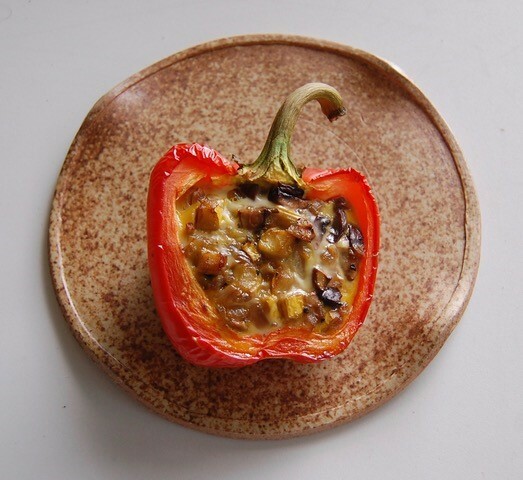 Divide the veggie filling between the 4 bell peppers and top with beaten eggs. Bake for 30-40 minutes, or until eggs are cooked. Remove from oven and top with basil and avocado slices.